From cover-to-cover SHOUT! travels in time from 1960 to 1970 chronicling the dawning liberation of women. See it at Glasgow’s Kings Theatre this Summer! SHOUT! is the musical magazine that brings back the beautiful birds and smashing sounds that made Britain swing in the ‘60s. It comes to Glasgow in July and features new arrangements of such classic tunes as To Sir With Love, Downtown, You Don’t Have to Say You Love Me, Son of a Preacher Man, and Goldfinger. Just as Dusty Springfield, Petula Clark, Cilla Black, and Lulu were Independent women with Major careers, British and American women were redefining themselves in the face of changing attitudes about gender. SHOUT! reflects that change through the unforgettable music of the time. 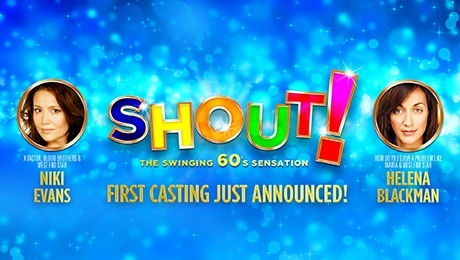 Book early for the best seats, with its irresistible blend of foot-stomping songs, eye-popping fashions and psychedelic dances, this delightful musical will make you want to throw our head back and SHOUT!